A quick way to change the design of your course is to simply change fonts. Theme fonts control headings, body text, questions, and answer choices. 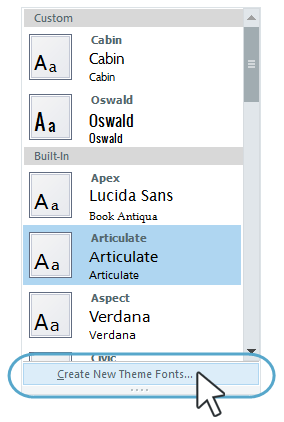 Articulate Storyline has several built-in theme fonts, but you can also create your own. If you've created any custom theme fonts, they'll appear at the top of the list in the Custom section. Built-In theme fonts appear beneath that. The theme fonts currently in use for the selected slide are highlighted in blue. For each set of theme fonts, you'll see the name of the theme, the heading font, and the body font. Apply to Matching Slides: This applies the theme fonts to all slides based on the same slide master as the current slide. Edit: This opens the theme fonts editor. (See Customizing Theme Fonts below.) This option is only available for theme fonts you've created, not any of the built-in theme fonts. 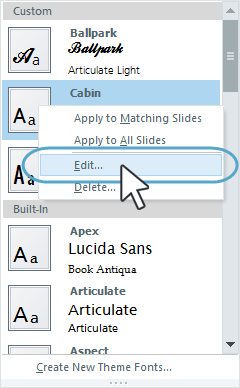 Delete: This removes the selected theme fonts from Storyline. This option is only available for theme fonts you've created, not any of the built-in theme fonts. In the Name field, enter a name for your custom theme fonts. 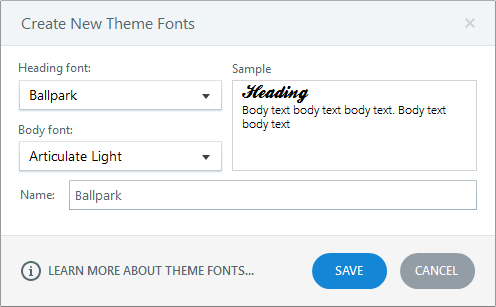 When the theme fonts editor appears, choose a new heading font and/or body font. Then, click the Fonts drop-down again and choose Create New Theme Fonts. The theme fonts editor will open, and the fonts will default to those from the built-in theme you're currently using (from step 1). 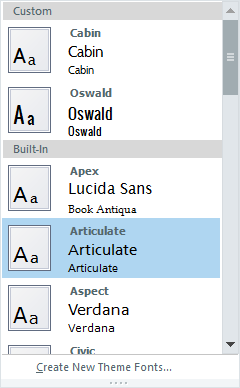 Just edit the fonts to your liking and save the theme fonts under a new name. How Do Theme Fonts Relate to My Font Choices on Slide Masters and Layouts? You can apply theme fonts to slide masters in the same way you apply them to content slides. Slides in your course that are based on the modified slide master will inherit those same theme fonts. You can always override the font assignment for a slide by manually customizing individual text boxes.